So you want to know about us, huh? ​Chris and I (Lindsay) were married in 2009. We started dreaming about having a homestead from Day 1. The dream has changed many times, and continues to evolve as we live our dream every day. Emma is our oldest. She loves taking care of everyone and everything on the homestead. Liam is younger by 17 months. He loves working with daddy. We homeschool, we garden, we raise animals for many reasons. We love prepping, permaculture and education. If you wanna know more about us, just ask. 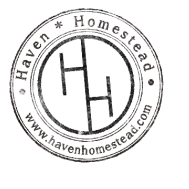 Here at Haven Homestead, we want to create a haven where learning, responsibility, abundance and love can abound. That's our whole purpose for doing what we do. We love learning. We love to share what we learn. We take responsibility for our actions and we expect the same of others. We don't want to be rich. Let me rephrase that. We don't care about being monetarily rich. We want to live an abundant life. To us, that means always having enough of whatever we need, not specifically money, plus maybe a little to share. We love each other very much. We believe that we all have a loving Heavenly Father who is watching us all with vested interest. We want others to feel that love. In our home, we hope you will feel the respect, caring and support that we consider paramount to our existence. In short, the plan is to prepare our family financially, emotionally, and physically for living in a tough world, and help others to do the same. The list goes on, but I wont. All in all, it's pretty easy to see that we are good people doing the best we can with what we have. We'd love for you to join us on the journey by listening to the podcast, reading our blog, and checking out our classes. If nothing else, start a conversation with us. We all love to talk. You can find us on Facebook, Instagram, Twitter, Spreaker, and here on our website. Feel free to email us. We look forward to hearing from you.